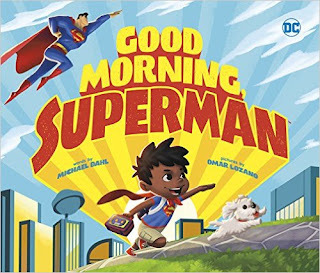 This week we read Good Morning, Superman by Michael Dahl and illustrated by Omar Lozano. This is a SUPER book for young children. Our family is superhero-friendly. All toy boxes and book shelves are filled with all things superhero related. So, when the opportunity came along to read this book, I jumped at the chance. Good Morning, Superman is a fun book to look at because the children’s morning routine is mirrored by Superman’s hero saving activities. Time to get dressed, just like Clark Kent! Duty calls for our young hero (time to use the potty and brush his teeth), while the panel also shows how duty calls superman to save the day! This book is not only fun and brightly illustrated, it works well to teach your child a morning routine. For those parents struggling to get their kids up and out of the door in the morning, this book will be helpful in teaching them an easy routine in a fun way. It is a great book to add to your superhero collection.